I don't have any problem with the Dogon knowing whatever they know. My problem is that nobody seems to have read Griaule's Pale Fox (not even me). The authors Lizzie quotes use Temple and cobble their own half-baked ideas onto his. Gary N said: Well, I hope some of those ideas are wrong, they don't fit MY view of the way things are! There is still a reliance on gravity, and a standard solar evolution. I'll stick with my EM sun, for now. As most of the heat and light arriving on Earth comes from the area of the corona in the middle of the face of the sun or the direct line between the core of the sun and the Earth then there is a possible transfer of energy of the nuclear fires at the core of the sun to the corona bypassing the intervening gases of the body of the sun. Orgone is a term coined by Wilhelm Reich to define aetheric or fourth dimensional matter. From Hermetic teachings there are one hundred elements making up the aetheric periodic table of elements, slightly more than the ninety-two naturally occurring elements of the third dimension. The attraction between the aetheric proton and electron is magnetic. Ionized aetheric material strips electrons off physical material when the aetheric material move at right angles to the motion of the electrons. Electric current strips off aetheric electrons, magnetically ionizing orgone and creating a magnetic field. The particle or magnetic monopole behind ferromagnetism is the fourth dimensional electron. A fourth dimensional electron is about a thousand times the volume of the third dimensional electron. The fourth dimensional electron is behind the phenomena of "spin" in atomic physics. Once grasped the conception of dovetailing dimensions is easy to visualize. James Clerk Maxwell saw it clearly 150 years ago but the Illuminati did not allow the simplicity of "nested" dimensions to be taught. Oliver Heaviside altered Maxwell's equations in such a way as to hide the aetheric action of magnetism and express electromagnetism as entirely created by the properties of the third dimension. The exclusion of Aether has stunted the development of higher dimensional physics. Einstein's theory further obscures the simple understanding of aetheric influences. In Relativistic terms the fourth dimension is incomprehensible to the human mind. That is exactly what the Illuminati intended. Aether or Orgone is easy to understand. The special elements which make up the corona are permanently ionized orgone. In the same way that iron, cobalt and nickel are the three physical elements which are ferromagnetic, the elements in the Aether may be their orgone equivalents. The unpaired electron which imparts the ferromagnetic characteristic is held in position by an unpaired aetheric electron. The ferromagnetic elements create aetheric ionization. As iron, cobalt and nickel are elements number, 26, 27 and 28, the size of these atoms is similar and size has something to do with holding of the aetheric electron. Possibly the physical atom size matches the aetheric electron size. Aetheric Coronal Elements likewise are a match to the next higher dimension's electron. As the attraction between the fifth dimensional electron and proton is not defined by physical science someone will have to give that bonding energy a name. Maxwell's intuition was that there had to be another density or dimension surrounding and containing the fourth dimension as the fourth dimension forms and shapes the third dimension. The creation of undefined atoms in Bose-Einstein Condensates near absolute zero indicates the separation of fourth dimensional constraints on the condensate atoms. Still there is something holding the atoms from flying apart and that is possibly the fifth dimension. Superconductivity is also an absence of aetheric constraints on the flow of electrons. ACE is permanently ionized aetheric material in the same way iron is always magnetic. Something pouring out of the core of the sun interacts with the ACE and the plasma of the corona to create heat and light. ACE keeps the Earth warm. During a total solar eclipse when the majority of photosphere light is blocked, the corona is visible. A portion of the corona is being illuminated by energy from stars beyond the sun by the same higher dimensional energy transfer. ACE is the preferred power source on most advanced planets as it is non-polluting and it can be adapted for any use. A few grams of ACE can heat and light a house. A kilogram of ACE can power a UFO. The technical prowess of the artisans of Nibiru was such that they were able to fuse the large quartz crystals and fashion the crystals of the ancients. ACE powered tools were able to cut granite like butter. ACE powered tools were able to lift and position megalithic stones which are found worldwide. One of the feats of advanced civilizations is to create the inertia-less lifting of any mass. Gary N said: The crystal, yes, it does fit my picture, though the crystal latice shape might have to be from hydrogen in a different phase, to produce the shape I believe exists there. I suspect JL knows what shape I think the crystal would be, maybe you too lizzie? Now out of the plane, the sacred, living system of geometry continues to unfold in three dimensions. It is paralleled by the Platonic solids (and the cube-octahedron). The 6-faces of the cube also define the vertices of an octahedron. The octahedron "jitterbugs" into first an icosahedron, and then into a cube-octahedron. Fuller calls the cube-octahedron the vector-equilibrium because it holds twelve radial vectors in equilibrium around its center. This unique twelve around one pattern is the "Thirteen Petaled Rose" referred to in the introduction to the classic kabbalistic work, the Sefer Zohar, the Book of Splendour. The cube-octahedron is the simplest 3-dimensional form that can pull through itself like a torus. When it does, it becomes encased in a dodecahedron, which splits open and throws out new seed to restart the process. The whole process takes nine "triangular" stages. Another sacred form that expresses this same process of life is the Sri Yantra. The Sri Yantra is the creation mandala in the eastern traditions. It consists of 9-interpenetrating triangles, representing the union of the male and female principles. In the center of the Sri Yantra is a "bindu", toroidal point. The perimeter of the Sri Yantra is said to lie on a hypersphere. A connection between the creation of toroidal moments and the breaking of the relativistic crystalline group associated to a given crystal is presented in this paper. Indeed, if magnetoelectric effects exist, the interaction between electrons and elementary magnetic cells appears in such a way that the resulting local polarization and magnetization break the local relativistic crystalline symmetry. Therefore, a Goldstone boson responsible for the production of toroidal moments is created and, consequently toroidal phases arise in the crystal. The list of the Shubnikov groups compatible with this kind of phases is given and possible consequences in superconductor theory in magnetoelectric crystals are examined. Multiferroics are materials in which at least two of the ferroelectric, ferro/antiferromagnetic and ferroelastic phases coexist. Though the mechanisms that allow ferroelectricity and ferromagnetism seem to be incompatible, there are a select few materials in which ferroelectricity and ferromagnetism are both present. In these materials, the ferroelectric and ferro/antiferromagnetic phases are coupled in such as way as to produce a cross phenomenon known as the magnetoelectric (ME) effect. This allows manipulation of the magnetic phase with an external electric field and/or manipulation of the electric phase with external magnetic field. The integration of the ME effect into device technology would have substantial implications. Three primary colours are created by the three relative tilting angles of the primary tetrahedron controlling the toroid in a dodecahedron. These colours have an activating or accelerating effect. The complete hexadynamic geometry of colour coding is based on the fact that the toroid, if oriënted by the tetrahedron's "merkaba" complement, makes different angles with the dodecahedron. This creates the 3 secondary colours, which have a rather calming or inhibiting effect. What kind of crystal? Magnetite? Tourmaline? Oh wow. Lets clean up the mess a bit. Arc-us you are right, but both sides need to be debunked. Anthropologist judging everything by using their own (modern western) culture are the worst. Those guys had not the slightest clue what the Dogon tried to tell them. Its embarrassing to say the least. - In the question of how the Dogon People came to knowledge of Sirius and its lost companion stars, there are just 3 possibilities in my mind: Either they were physically or spiritually visited by extraterrestrials who told them a lot of things, or some Dogon Tribe individuals got this knowledge by the ancient traditional spiritual ways by out-of-body-travellings. "At first they led a somewhat wretched existence and lived without rule after the manner of beasts. But, in the first year after the flood appeared an animal endowed with human reason, named Oannes, who rose from out of the Erythian Sea, at the point where it borders Babylonia. He had the whole body of a fish, but above his fish's head he had another head which was that of a man, and human feet emerged from beneath his fish's tail. He had a human voice, and an image of him is preserved unto this day. He passed the day in the midst of men without taking food; he taught them the use of letters, sciences and arts of all kinds. He taught them to construct cities, to found temples, to compile laws, and explained to them the principles of geometrical knowledge. He made them distinguish the seeds of the earth, and showed them how to collect the fruits; in short he instructed them in everything which could tend to soften human manners and humanize their laws. From that time nothing material has been added by way of improvement to his instructions. And when the sun set, this being Oannes, retired again into the sea, for he was amphibious. After this there appeared other animals like Oannes. ", end of quote. Oannes, the Sea God? The Whale Constellation? In the roughly direction of Sirius? 1. At first they led a somewhat wretched existence and lived without rule after the manner of beasts. 2. But, in the first year after the flood. 5. He had the whole body of a fish, but above his fish's head he had another head which was that of a man, and human feet emerged from beneath his fish's tail. 7. He passed the day in the midst of men without taking food. 8. He taught them to construct cities, to found temples, to compile laws, and explained to them the principles of geometrical knowledge. 9. He instructed them in everything which could tend to soften human manners and humanize their laws. 10. When the sun set, this being Oannes, retired again into the sea, for he was amphibious. Dogon believe that the brightest star in the sky, Sirius (sigi tolo or 'star of the Sigui), has two companion stars, pō tolo (the Digitaria star), and ęmmę ya tolo, (the female Sorghum star) (Flower, Seed?) respectively the first and second companions of Sirius. Sirius, in the Dogon system, formed one of the foci for the orbit of a tiny star, the companionate Digitaria star. When Digitaria is closest to Sirius, that star brightens: when it is farthest from Sirius, it gives off a twinkling effect that suggests to the observer several stars. The orbit cycle takes 50 years. But why would Sirius be such an important guiding star of Wisdom and “origin of Life”? Why is it that Sirius apparently shows up in many mythological telling and myths? - Can one use a modern Star Atlas map in order to solve the meaning of myths? I think so. But of course, you have to have an idea or a hypothesis in order to do so. My idea here is to locate the Sirius Star, and se where it is located accordingly to the Pole Star that we all use in order to navigate on the celestial Heaven. The actual North Pole Star hasn’t always been the guiding star. Because of the processional movement the processional Earth Axle point moves 1 degree every 71.6 year in the circumpolar circle. So, in order to locate and orientate the Sirius star accordingly to the center in the circumpolar circle and thereby get a positional line which takes the circumpolar movement out of equation, we thereby gets a star guiding line which directionally relates the Sirius star to all other stars in our Galaxy. When drawing a line from Sirius in the constellation of Canis Major, through the circumpolar center and further on to the Vega star in Lyra, and further on to the constellation of Sagittarius, one gets a general guiding line to the center of our Galaxy and by making a 90 degree angle on the line in the circumpolar center and prolonging this line, we get the 4 cardinal directions in our galaxy, Sagittarius (Galaxy Center), Gemini (Gemini/Sirius) Pisces and Virgo. Thereby we have the 4 spoke Galactic Wheel, which in ancient times very often was divided into 4 more directions of the 4 Animals, Eagle, Bull, Lion and Horse (Or other local animals). The Sirius-Vega Ruler-Line: On midnight Jan. 3 and July 3 the Ruler Line roughly marks the Earth orbital position comparing to the center of our Milky Way Galaxy and away from our Milky Way galaxy center. The 90 degree angle from the celestial Pole marks increasing galactic power and decreasing galactic power periods. That is: By positioning the Sirius star in our Galaxy, we have got the knowledge of the generally cardinal directions in our Milky Way Galaxy and maybe thereby confirmed that the Dogon People really learned a lot from the Oannes/Sirius source. When knowing these information’s of the 4 galactic directions, the basics for building their villages and temples was stated and by building accordingly to these information’s, the Dogon People – and all other cultures in the World – could follow the rules below on Earth of Heavenly above. Thereby “He taught them to construct cities, to found temples, to compile laws, and explained to them the principles of geometrical knowledge. He made them distinguish the seeds of the earth, and showed them how to collect the fruits; in short he instructed them in everything which could tend to soften human manners and humanize their laws”. That is: By following the heavenly rhythms, the people would learn everything about their individual and cultural connection to the Heavenly Creation Powers and also get the knowledge of the seasonal changes and of the vegetable and animal rhythms as well. But coming that far, we still have the question of HOW the Dogon People got the knowledge of the Sirius Star System, and my suggestion is this: Individuals in the Dogon Tribe – and individuals from all other cultures – visited the Sirius System by Spiritual Travelling out-of body journeys, AND, if there were/are beings living on this system, they maybe also have visited Earth by the same way and means many times in the past. And maybe they still are? Oannes appeared in the first year after the flood. He had a human voice, but the whole body of a fish, and above his fish's head he had another head which was that of a man, and human feet emerged from beneath his fish's tail. “He”, a supposedly anthropomorphic being told them this? Or was this being really 2 beings? A male voice coming from the Heavenly waters in the direction of certain Star Constellation? From, after which Flood did “he/this voice of a man”, first appear? Mythologically, “Flood” mostly means “heavenly rivers or streams” And the biggest heavenly flood/river/stream is of course the Milky Way River encircling the Earth hemispheres, which again connects us to the Sirius Star and the direction in the Milky Way Galaxy. Can it possibly be that there is a deeper connection to the Sirius Star – or maybe even to its lost companions? What happen when a star explodes? That, of course, depends of what kind of a star it is. With a mass nearly equal to the Sun's, Sirius B is one of the more massive white dwarfs known and Sirius B will steadily cool as the remaining heat is radiated into space over a period of more than two billion years. A white dwarf forms only after the star has evolved from the main sequence and then passed through a red giant stage. This occurred when Sirius B was less than half its current age, approximately 120 million years ago. The original star had an estimated 5 solar masses and was a B-type star (roughly B4-5) when it still was on the main sequence. While it passed through the red giant stage, Sirius B may have enriched the metallicity of its companion. Image of Sirius A and Sirius B taken by the Hubble Space Telescope. Sirius B, which is a white dwarf, can be seen as a faint dot to the lower left of the much brighter Sirius A. “Then we are introduced to the enigmatic Po Tolo, "Star of Fonio" and known here as "Digitaria." This is stated to be the "origin of all things." When a massive star explodes, it radiates out a lot of energy that influences its surroundings. This kind of cosmic energies comes in 2 forms: Either radially out in all directions from the center or a more directed form as in “cosmic lighthouses”. Quote: “Some odd facts, such as the knowledge that Sirius B is spinning and discarding matter, for instance, data established long after 1950, are hard to explain”. Milky Way contours with the “male” human or animal “deity” to the left and the “female” to the right. It is said above: “Sirius B may have enriched the metallicity of its companion” when it colapsed/exploded. Quote: “Much more interesting is the Dogon concept of "Sagala," supposed to be shiny and metallic. It is a feat of tremendous imagination to name and give physical properties to white-dwarf material”, answers the modern astrophysicists and cosmologists. And what does “the female Sorghum star” means”? I`v just image-googled “sorghum” and get a special flower native for Africa and very rich on seeds. If specifically concentrating on the “female” aspect this once again also can point to the Earth and Galactic Mother deities, but I´m not sure where to place this “sorghum”. Quote: “It shows at the very least that to verify this innocent and (native mythology, my remark) folk data, Western Man has to put some massively sophisticated instrumentation on a rocket and blast it into earth orbit”. - And, at the very most, it shows that it is not necessary to “go out there” in tin-cans in order to gain Cosmic and Universal knowledge for a lots of money when you can get it for nothing else than the Dogon Tribe and all other Native People have done for thousands of years. I hope you are armed because I'm wielding Occam's Razor. First a correction: Berossus wasn't 13th century BCE more like 2nd or 3rd. I think that it might be Eusebius who is quoting Berossus quoting Sanchuniathon that you are quoting. 1-3. They are post-catastrophe survivors. This being (human) came from a nation/society not affected by said catastrophe. 4. Erythian Sea. Nobody seems to know where this is but my guess would be the Persian Gulf/Indian Ocean. 5. Oannes is described as having the body of a fish with the body of a man underneath. Ditto his head. See pics below. 6. The image 'preserved to this day' would probably refer to the 3rd century CE (Eusebius) at the latest. 7. He probably didn't want food poisoning. Or he may have been a vegetarion (if he was Indian?). 8 - 9. The Indians, among others would have had all this knowledge at this time. (So would these people still have had if it had not been for the catastrophe). 10. He went back to his ship for safety and to report to his superiors and he probably didn't want to catch fleas. Note how the warrior wears his helmet pushed back on his head. - And I have just sharpen my Sword . . .
That’s what very often happen when you quote a quote . . I don´t know about the post-catastrophe survivors business. I se this more as a kind of natural evolution/spiritual education. Grey Cloud, if you should look after a mythological Erytian sea and not a geograpical sea, where could the the root of Erytian + mythological water then lead to? Stars travel in groups or streams, moving through space in the same direction. Our sun with many other stars travel together in the Canopus Stream. The Ursa Major Stream contains Sirius A and B, and the Big Dipper, as well as about 160 other major stars and their companions. Because of their position at the very head or leading edge of this stream, the stars known as Ursa Major or the Big Dipper actually lead the remaining stars on their sojourn through space. The third, the Hyades Stream, contains the Pleiades and many others. At one location, all three streams intersect ... our sun is located at this point. The vast streams of stars encompassing many light years all reside within an arm of the Milky Way Galaxy. To be exact, it’s not an official arm like the Sagittarius or Perseus arm, but a smaller offshoot called a spur — in this case, the Orion Spur, because it juts out from the Orion Arm of the galaxy. At the junction point where the Orion Spur meets with the larger galactic arm can be found one of the vastest stars known in the galaxy, Betelgeuse. A supergiant radiating unbelievable amounts of heat and energy at a distance of, fortunately for us, 520 light years, Betelgeuse knows no equal in sheer volume or area of influence. Betelgeuse is a first generation star, and actually gave birth to some, not all, of the stars in the Orion Spur in which we reside. Like some immense cosmic mother, its enormous magnetic field most likely envelops all life forms within the Orion Spur. One might ask, "How could a star as far away as Betelgeuse have an effect on us?" Has Betelgeuse imprinted its cycle of 5.2 on everything within its vast reach, literally laying down the resonant code to which all other stars in the Spur and their planets must adhere? If Betelgeuse is laying down the "mother" frequency for the etheric plane due to its tremendous magnetic influence, can we create a higher vibration in our own etheric bodies by consciously tuning into its frequency? Will Betelgeuse Go Supernova in 2012? In this essay I discuss the recent news of the possibility that the star Betlegeuse (Orion’s right shoulder) will soon go supernova in the context of the 2012 Mayan calendar. Seeing Red: Will Betelgeuse Go Supernova in 2012? Good to see you back illuminating this place like the star youare. There's a lot to look through in this, but keep in mind the ophamalos stones, and the points they are/were upon, and the sound going through them, like a feathered wind. Junglelord said: Reading the book about antigravity by Paul Laviolette, and the work by TT Brown and the effects of the solar, lunar and cosmic cycles on petrovoltics and his electrogravitics....how timely. Gary N said: Regarding the previous posting about the 12 around 1 and the weave circles, I see there was another one before those that was the tetrahedron. The quadrupole is built in to the fabric of space, cool. We must alter the unit in our head to synch with the whole. Kevin said: The omphalos stones will have been placed on the most relevant points in a sort of mainframe matrix that will be of universe. Thus longitude and latitude are best thought of as the lines of the weave, and the crossing points where the Ophamalos stones were placed to act as oracle antennae, receivers and transmitters of a knowledge based universal system. Two poles exist in Stage 1. In Stage 2, eight poles exist in total. In Stage 3, sixty four poles exist, and finally in Stage 4, five hundred and twelve poles exist. The picture directly above is a stage 4 formation of 512 poles or 256 separate universal patterns. One can see that a larger spherical pattern emerges and comes as a result of the combined 512 poles. When a long magnet is curved around itself and its positive and negative poles touch each other to form a ring, the poles dissolve. There is no longer a centralized negative and positive pole in single localized areas. The video below shows how a magnetic field creates a lotus flower pattern which comes as a result of two vortexes of ether, spinning in opposite directions. They create standing waves in the gold mean spiral. Geometry and counter rotating magnets: Counter rotating magnets open dimensional doorways in the hyprdimensional merkaba energy field created during the 2012 galactic alignment through phase conjugation. Dodecadiamond Sphere - "Twelve Around One"
The Dodecadiamond Sphere is technically called a Stellated Dodecahedron. It consists of 12 pentagons. The 12 pentagons are joined together in a sphere with raised diamond shapes on, and along each edge, thus creating 12 crowns or nodes. All of the platonic solids can be seen within the Dodecadiamond Sphere; the Cube/Hexahedron, Tetrahedron, Octahedron, Dodecahedron and Icosahedron. A double six pointed star or Star Tetrahedron can also be seen from the 12 crowns or nodes, thus creating the perfect Mer Ka Ba. The Mer Ka Ba is a spiral of energy that can move us from one dimension to another. It consists of counter- rotating fields of energy that surround each living thing. The Mer Ka Ba is made up of two star tetrahedrons, one male and one female. The Merkabah is also the shape of the Star of David which can be seen within the Dodecadiamond Sphere. Why has Tom Bearden given up on Phase Conjugation? This follows the work of Keely and the entire field of music and resonance. By creating interference patterns (constructive or destructive), you can affect energy or mass. The ideal free energy device would use a tuned waveplate or a geometry that produces such a wavefront that it would "interfere" with incoming energies to produce side effects as specified in the neutral Aether Spectrum. That is one of the reasons for our interest in "Magic Squares", because they form the geometries that can act as kaleidoscopic multipliers or dividers of these incoming energies or simply Aether/gravity to keep it simple. Keely also indicates that in a differentiated mass (such as a "conditioned" magnet), all of the "knotholes" or nodes of interference are removed. Once this is done, the mass becomes essentially superconducting because of the instant communication of force throughout its aggregate structure. When that occurs, change of one single molecule will instantly change all other molecules of like composition because the aggregate has been attuned to a harmonious or "differentiated" condition. The point here is that phase conjugation is extremely important to our quest for free energy devices because it defines the practical application of frequency to produce effects. The alchemical secret is threefold, or rather, that there are three transformations in one. The inner transmutation, revelation involves the refining of the cerebrospinal energies (kundalani) so that more light may be absorbed and transmitted to the DNA. The outer transmutation, the demonstration, is the ability to use those energies to effect transmutations of physical states, including the elements. The third transmutation is that of the quality of time itself, from the darkness of the Iron Age to the splendor of the Golden Age. The prima material was likewise not just any matter, but matter that had been enlivened enough so that it could retain the charge of memory required to effect transformation. This transmutation on one level appears to be a geometric rearrangement of the elemental structure of the substance upon which it is acting. The Kabalistic Tree is sometimes called The Sephirotic Tree of Life. The circles or spheres are called sephiroth. A single circle or sphere is called a sephira. The teachings about the Kabalistic Tree of Life are very deep and complex. The ten spheres and 22 paths of The Tree generally represent the nature of the forces behind Creation on all levels, from microscopic to macrocosmic. The Tarot Cards are also associated with The Tree. The design is based on a ring of six interlocking circles. In the formation that appeared with the Tree of Life, the plants were laid down in a manner that formed a pinwheel-like design, with six crescent moon-like shapes. He showed that the Mandelbrot Set formation is similar to the Kabalistic Tree of Life, except for the top circle, which is Keter, the Crown, the One Source is "missing." He suggested that this may mean that "Keter is moving into Daat." A group of German researchers made a convincing argument about the bent pathway in the triangular 1991 Barbury Castle formation. By deciphering a number of formations, they theorized that a message was being given about star patterns in the area of the sky known as the "Winter Hexagon." Further, a triangle was indicated in the stars of Orion, which are within the Winter Hexagon. The top of the triangle is located at the left-most star in Orion's Belt, known as Zeta Orionis. Another star is located near the edge of the imaginary triangle in the sky, and it is in the exact position of the bend or kink in the Barbury Castle triangular crop formation. The triangle in the sky is at an angle of 19.5 degrees. The location of the star and the angle of the sky triangle are especially significant for a number of reasons. The research of Richard Hoagland, Robert Bauval, Adrian Gilbert, Graham Hancock, and others indicate that the three great pyramids at Giza represent the stars of Orion's Belt, and that the passageway from the King's chamber pointed to those stars. The stars represented the God, Osiris. The Queen's chamber passageway is thought to have pointed to the bright star, Sirius, representing the Goddess Isis. Richard Hoagland discovered, incredibly, that all of the Apollo moon landings were precisely timed to the positions of the same stars. Either the Belt Stars of Orion or the Star Sirius were aligned with the horizon or at 19.5 degrees at the exact time of the landings. The geometry and hyperdimensional mathematics found in the monuments on Mars , according to Hoagland and his associates are related to the Giza Pyramids, to the ancient sites in England where most of the crop formations have been appearing, and to the Barbury Castle crop circle formation of 1991. One of the conclusions is that there is an energy that exists within planetary spheres, including the sun and stars, by which they are created from another dimension. The energy inside the planetary spheres is shaped like two interlaced tetrahedrons. In a two-dimensional representation, this is like a Star of David inside a circle. One tetrahedron touches the surface of the planetary sphere at the north pole and the other touches at the south pole. Three points of each tetrahedron touch the surface of the planetary sphere at 19.5 degrees north and south. Scholars have pointed out that the Egyptian figures are one of many symbols of the Trinity. The birth of the falcon-headed Horus, is associated with the coming of a new age. For many years a woman known as Solara has been teaching about the opening of the "11:11 Dimensional Doorway" in the Belt of Orion. Pages 35 and 36 of the book have photographs of pyramidal formations on Mars taken by Mariner 9 in 1971. Enoch told Dr. Hurtak that these are part of a grid network in our solar system. The earth also has a grid. There will be a grid shift and alignment between the two grids, as the earth changes unfold. This will happen when the earth enters an electromagnetic null zone. Around 1993, I started corresponding with Geoffrey Farthing, the secretary of the Blavatsky Trust in England. I had found an amazing number of connections in H.P. Blavatsky's, Isis Unveiled, volume 2. I explained to Geoffrey that dreams and crop formations seemed to be related to Blavatsky's concepts, and that a Great Change seemed to be near. He sent me his book, Deity, Cosmos and Man, which gives an outline of Esoteric Science, as presented in the vast works of H.P. Blavatsky. Geoffrey also told me that Blavatsky associates the Sephirotic Tree of Life with everything else in her works, which involve myths and religions from around the world. When the Sephirotic Tree of Life appeared in the crops in 1997, I felt that it was quite profound and meaningful. Unlike most of the crop formations, this pattern is well known; there is no question about what it is. Debbie says that the Tree of Life is like a map defining Creation and the origins of Spirituality. There are ten Sephiroth/spheres of existence and 22 connecting pathways. The Hebrew alphabet has 22 letters. (Note: In The Book of Knowledge, The Keys of Enoch, Dr. Hurtak explained that the 22 Hebrew letters, which are called, "Fire Letters," are used as a code in creation. Debbie goes on to explain that there are also 22 Tarot cards that make up the Major Arcana. Each is assigned to a path on the Tree. The spheres/sephiroth on the left side of the Tree are feminine and those on the right are masculine. The ones in the middle row indicate a balance of the duality attributes. Two of the sephiroth on the sides are called HOD and NETZACH, representing Mercury and Venus, or the Head and the Heart, or the Intellect and Emotions. The lateral path joining the two is represented by the Tarot card known as The Tower. This card depicts people falling from a tower and being struck by lightning. The Trinity is a common link to almost everything we are seeing. The Apollo moon landings were precicely timed so that the belt of Orion or the star Sirius were aligned at the horizon or at 19.5 degrees, the tetrahedral point found by Richard Hoagland's team in the geometry/mathematics of Mars. Those stars, of course, represented the Osiris and Isis. Hoagland also shows how the Mars monuments connect to the Giza monuments, and to the Barbury Castle pictogram. Also, an overlay of the Cydonia region of Mars matches point-for-point with the ancient sites in the Wessex triangle. There is a definite pattern that I have been documenting for about six years. The forms of it match best with H.P. Blavatsky's explanations in Isis Unveiled, vol. 2. A few days ago, I found another great connection in the quatrains of Nostradamus. It is in Century 4, Quatrains 28-33. This concerns the theories of alchemists about the sun (sulfer), the moon (salt), and Mercury (quicksilver). The glyphs on the corners of the triangle of Barbury are said to parallel these alchemical signs. Their work involved the attempt to transmuting elements, such as lead into gold, and finding a substance that gave eternal life. This became centered on cinnabar, the Hell Fire Stone, which is the ore of mercury, sulfuric sulfide. There were six steps on the ratchet/Mercury spiral of Barbury. The angle from the center of the triangle to the southwest corner was at 120 degrees. From that point to the center of the ratchet, it was 108 degrees, a mythical/Gematrian number. 120 is a tetrahedral point. 120 x 108 = 12,960, six raised to the fourth power times ten, and half the precession number. Divided by the six arcs, it is 2,160, six to the third times ten, and the number of years in one Zodiac Age. Whether you embrace the gospels from the perspective of faith, or via decoded midrash physics and allegory, the results are (can be) identical, because the allegory as well as the literal interpretation incorporate ancient wisdom teachings regarding the evolution and refinement of human of consciousness leading to eternal life. Were the Synoptic gospels events depicting historical events or are they an astronomical/astrological allegory incorporating both ancient wisdom teachings and the quantum physics of light? Also, is what is written in the heavens (stars) truly made manifest on the Earth? In 5 B.C., according to my research, a change of Ages (Aries to Pisces) occurred which was also the end of one "Great Year" (or Great Year of Plato which is 25,920 years of astronomical precession) and the beginning of a new Age. Additionally, there was the appearance of a, once in over 40,000,000 years, celestial configuration in the form of a Seal of Solomon and the start of a new religion (Christianity). All of these spectacular events share a common origin... the science of the stars! For almost two thousand years archaeologists, astronomers, Egyptologists and religious scholars have been looking, without success, for the biblical Star of Bethlehem and the "missing" capstone of The Great Pyramid. The essence of the information and charts published here is that the Star of Bethlehem and the capstone of The Great Pyramid are both ancient astrological configurations. Over the centuries an enlightened community of astronomer priests (Magi) could gradually construct a planetary ephemeris for the unobservable planets. The frequent passages of the inner planets, continually transiting 'sensitive degrees' in the zodiac, would reveal, over time, the astrological locations of the distant planets. Their distance from the Earth, perhaps, could not be precisely calculated, however, the planets' precise locations within the astrological wheel (and their orbital patterns) could, eventually, be determined. The astrological aspects (parallels) depict the solar version of the Kabbala - "Tree of Life" or "Paths to God"
Any student of the mysteries will recognize the pattern displayed by the planets as one which mirrors the Tree of Life and the various "paths" to higher consciousness, which are depicted also in this ancient graphic. Kevin said: There's a lot to look through in this, but keep in mind the ophamalos stones, and the points they are/were upon, and the sound going through them, like a feathered wind. Gravity is a unique field phenomena that functions under complex laws. Earth's gravity is hers alone, for it contains all the vibrations of all materials and life forms of this planet. It breaths in overtones the cycles and energies unique to this watery blue address in space. Gravity holds it all together. It uplifts and puts down. It translates the cosmic music into tones human beings can understand. It is a creative center which closely resembles the great cosmic center which we call the "Eye of God"." Gravity begins with a centering of a point of potential energy upon a strong central axis. The potential center of earth, provided by both the sun and the galaxy, is a seeded replica of that which centers Universal forces. Its axes are compounded to serve the activities of MIND. The WORD is spoken. Life dwells in the center and expresses to the outer edge of its sphere of influence. From the totality of the sphere it signals and receives. It performs like a self-conscious broadcasting station. "He (Keely) showed that "the sympathetic streams of energy are composed of triple currents of vibratory flow. This applies to magnetic, electric, gravital and cerebelic (brain and mind) flows... Since these flows are vibrational in nature and are tuned to their respective spheres, Keely believed this was the basis for the term "music of the spheres". Gravity is actually a triple connective radiation rather than a flow. It is an eternally existing force entering all forms of matter. Keely believed that gravity is the basic source from which all matter emerges. Keely called the stream coming into the earth at the poles from the sun the "polar stream". The 3 currents in this polar stream are magnetism, electricity and gravity". (Note: Elsewhere in Vogt’s book, Reality Revealed, he describes magnetism as the information from the 1st-dimension, electricity is 90 degrees to it and following or the 2nd-dimension, and gravity is shown to be generated by the first matter of universe, the primordial substance. In still another explanation that is plausible to me, electricity and magnetism are described as dead forces after gravity feeds the earth its Life Force from the sun). "The fundamental conception of universe is force manifesting itself in rhythmical relations". "Energy streams feeding matter again consist of 3 currents of force coded according to the triple vibratory scheme; where these triple currents meet they form a center of force and are maintained in a state of mutual attraction. This attractive force is gravity. The focal point of this force is defined as a "neutral center". The total number of possible forms of atomic subdivision from the basic triple stream are found by simple combinatorial mathematics; namely, 1 x 2 x 3 = 6. Within each of these levels were even finer modes of energy vibration. His final energy liberator was able to dissociate 27 levels of matter. The triple stream which feeds the atom splits into 3 distinct currents and each becomes the "dominant" current for each of the 3 interatomics making up the atom. "One axiom which is repeated throughout my researches is that the "finer the force, the greater the power". Similarly, Keely held that the "higher controls the lower". Thus the vibrations of the ether control gasses; the vibrations of gasses can control solid matter". "Atoms, planets, stars, etc., are thus seen to be vibrating energy structures held in equilibrium by the sympathetic streams sustaining them. By disturbing (altering) this oscillatory equilibrium via resonant impulses, Keely was able to perform his wondrous feats of scientific magic". (Note: The keyword here is to alter or disturb the equilibrium of matter. Musically this means using the dissonant frequencies and not the consonant. No one I know has ever understood this or attempted to employ the concept. If mass is in harmonic equilibrium, the only two ways to affect it is to resonate with the frequency or disturb it). "All masses are related harmonically to each other by the simple fact that matter is in harmonic equilibrium. Thus all forms of matter are related sympathetically to one another. By altering these sympathetic relations, practical results are obtained". "The quiescent (motionless, quiet) range of oscillation of an atom is 1/3 of its diameter vibrating at 20,000 cy/sec. By striking a chord representing the 3rd, 6th and 9th of the scale in octaves, Keely was able to alter the sympathetic stream's harmonic relations". "The 6th note in the scale reduces the range of molecular vibrations thus increasing solidification. This applies to the negative current (harmonic (-) atomic level) going into the mass". "The 9th note expands the atom making the mass less dense. Dissociation does not take place until the atom reaches 2/3 of its diameter. This is done by controlling the radiating current (enharmonic (+) molecular level) to the mass". to much mainstream. As long as they stick to the concept of gravity there wont be any insight. Gravity doesnt exist. Actually "gravity", pressure and density are attributes of the same force. And the force is an attribute of the space itself. Its the void force. Look mom, no gravity ! Do you think a water flee inside the water sphere is able to leave it ? Or does it need a rocket to escape ? My bets are on the rocket. The flee has not enough power to escape the surface tension. The sphere is not attracting objects placed outside. Actually it is pushing them off. What we observe is that the void force is pushing. The void force forces the surface. What we observe as free fall towards center is a pressure towards center. The optimal form for deep sea submarines is the sphere. 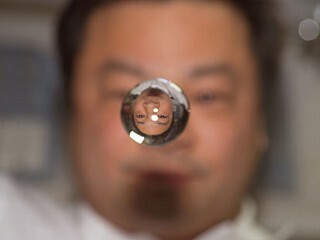 The sphere is optimal to withstand high pressure. The sky is full of spheres. Because they are under extremely high pressure by the void force. Sun(s) do show incredible high energies. No matter if we think electricity or fusion. What makes people think this could work without a force strong enough to keep those energies within a certain frame ? Ergo: gravity is a myth. No matter how you look at it. From Newton to Dr. Neo-eso scientist. Pure silliness. The truth is that the classic elements earth, water, air and fire radiate out of certain spots/knots with all force and energy the spot/knot allows and the fifth ring, the void, is confining it appropriate. Shut down LHC now !